The Big 5 International Building & Construction Show Forecast - Arrow Dragon Metal Products Co., Ltd - PVDF aluminum wall panels, aluminum honeycomb panels, stone veneer aluminum honeycomb panels, aluminum curved panels, aluminum carved panels, perforated aluminum panels constructional engineering supplier. The Big 5 Dubai is the largest construction event in the Middle East bringing together 65,000 participants making it one of the most important meeting points for the industry in the calendar. The event brings the entire portfolio of building materials, construction products, and solutions together under one roof. Manufacturers, suppliers, traders and service providers from Middle East Asia, Europe, and the Americas would be showcasing 1000’s of advanced technologies and solutions. 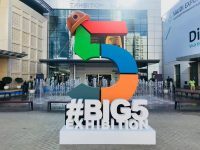 Attended by architects, engineers, builders, contractors, interior designers, consultants and all construction industry professionals, The Big 5 is a must-attend event that brings global network and credibility of The Big 5 series of events. We, ARROW DRAGON, will be one of the exhibitors to join the event. We will take all our series products, aluminum wall cladding panels, aluminum honeycomb panels, aluminum stone honeycomb panels, metal screen panels (mashrabiyya), double curved panels, and expanded metal mesh. All our product can be installed rapidly on site. All the contractors, engineers, consultants and architects are warmly welcomed to visit our booth. You will get inspiration from our samples which will help your project stand out in the prosperous markets. Welcome to visit us at Hall Arena, Booth Ar B248. See you in Dubai, UAE. Hall Arena, Booth Ar B248.